A career in the healthcare field can feel gratifying. Positions in this industry have the potential to bring rewards that go beyond remuneration. Employees spend their days implementing strategies and policies that make their communities happier and healthier places to live. However, those individuals who are committed to giving back through healthcare are often faced with a difficult educational choice: Should they pursue a Master in Health Administration (MHA) or a Master in Public Administration (MPA) degree? Which, in other words, would be a more beneficial choice for their careers in the long run? Both bring valuable knowledge in social and behavioral sciences, and both provide the education needed for career advancement in hospitals, government, and private businesses. When it comes to MHA vs MPA degrees, it’s important to understand the key differences and similarities. Outlined below are the vital things you need to know about public health and health administration degrees, along with their respective career choice options. Both degrees provide paths to healthcare management. Both degrees allow professionals the opportunity to advise senior executives on issues indispensable to operational management. Both degrees allow graduates to pursue additional certifications and degrees. Both careers allow professionals to work in a range of clinical and nonclinical settings. An MHA focuses on operational management and better allows job candidates to pursue positions in the private sector. An MHA typically allows for a higher compensation package. An MHA graduate can parlay their experience into other fields such as finance, clinical work, insurance, and information technology. An MHA degree provides coursework in a broad range of disciplines, such as human resources, finance, ethics, and health policy, which prepares students to become accountable, valuable staff of healthcare organizations. An MPA focuses more on the public sector and nonprofit management. An MPA degree prepares students to lead local, state, and federal governments and address critical public health issues facing the world today. Careers in both public administration and health administration include helping the community at large and ensuring an organization’s operations run smoothly and efficiently. However, a professional’s choice regarding pursuing an MHA vs MPA degree program can significantly impact which job opportunities are most available to them throughout their professional careers. For example, those interested in nonprofit settings might consider an occupation as a public administrator more in line with their passions. For those wanting to pursue a career path that allows for bigger picture, strategic thinking, a health administrator career would allow for this level of responsibility. Teaching others to manage their existing health conditions. Reporting findings to healthcare professionals. Advocating for individuals and community needs. Careers include health educators, community health workers, and government lobbyists. Median salary: According to the Bureau of Labor Statistics, public administrators earned an average of $44,390 per year or $21.34 per hour, and jobs are expected to grow an average of 16 percent until 2026. Developing goals and objectives of their respective departments. Representing the facility at investor meetings. Communicating with medical staff, including physicians, nurses, and support personnel. Careers include hospital administrator, nursing home administrator, healthcare marketing manager, and healthcare recruiter. Median salary: According to the BLS, such executive positions paid $103,950 in 2016, and job growth is expected to remain on par with the country’s average at eight percent until 2026. The proper choice all depends on an individual’s priorities and interests. However, both MHA and MPA degree holders can begin the process of developing a valuable foundation for a career in a worthwhile field, as career options for both degrees involve keeping communities healthy. For those interested in a career in health administration, consider Maryville’s online master’s degree in health administration. By earning a degree in health administration, students receive the education they need to start down the path of becoming a successful health administrator. 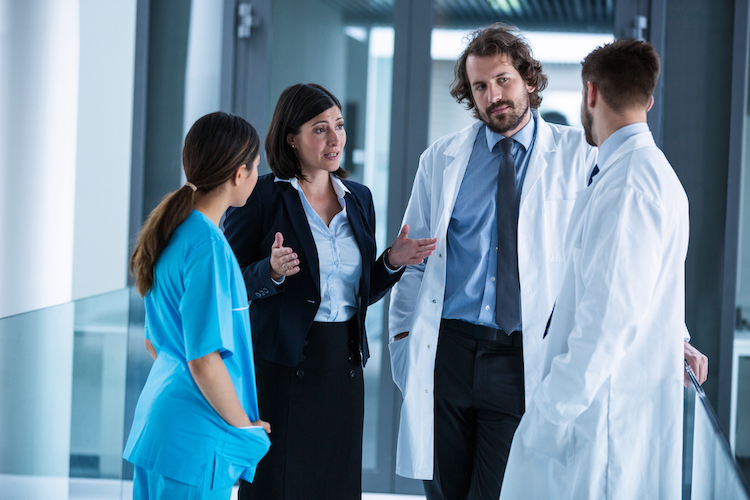 Those who want more information about health administration programs can find out more about what an MHA curriculum may entail here.